National Physical Therapy Month (NPTM) is celebrated each October to recognize the impact that physical therapists and physical therapist assistants have on the nation's healthcare community, helping organizations achieve positive patient outcomes, as well as encouraging citizens to live healthy and active lifestyles. For all of October, the focus is on the #ChoosePT campaign. Let’s continue the momentum of reaching out to consumers with the message that physical therapy is a safe alternative to opioids for pain relief. Don’t just mask the pain. Treat it. The American Physical Therapy Association and the Centers for Disease Control and Prevention (CDC) are urging healthcare providers to reduce the use of opioids in favor of safe alternatives like physical therapy. Get the conversation buzzing on social media by utilizing hashtag #ChoosePT and download the #ChoosePT cover/header photos by clicking here. 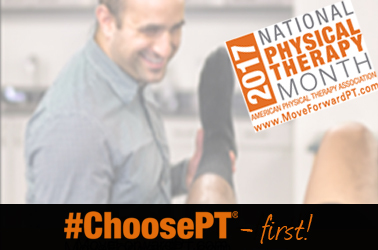 Educate your patients/clients and members of your community with handouts and key messages provided in this #ChoosePT Toolkit. Find a chronic pain support group in your area and ask for a meeting with the coordinator. Reach out to local addiction specialists and ensure they know about the benefits of physical therapy as an alternative to opioids for pain management. Familiarize yourself with these "7 Staggering Statistics About America's Opioid Epidemic". Consumers aren't the only ones who need to be aware of the prescription opioid and heroin crisis. To help educate physical therapy professionals, APTA has developed a 1-page overview for PTs and PTAs, including an opioid awareness checklist. Participate in this month's #THIRDTHURSDAY, focusing on #ChoosePT, Physical Therapy & Opioids. Participate in an NPTM event hosted by your workplace or PT/PTA program. If your workplace or school has an event planned the IPTA wants to know. Share pictures, stories, and info on your NPTM celebration and we will feature it in an upcoming newsletter. Email Matthew at mnicholas@ipta.org with all the details. Attend your upcoming District meeting! Dates and meeting locations are listed on the IPTA calendar. Each district has been provided with some fun giveaways from the IPTA Chapter Office. You may even win a FREE registration to the 2018 REVITALIZE Conference & EXPO! Each district will be offering 1 FREE hour of CE during the meetings. Colleen Flannery, IPTA Executive Director & Mike Riley, PT, IPTA President will be presenting on "Taking the Next Steps Towards Improving Access to Physical Therapy in Illinois". You don't want to miss this! Information will be presented about our new campaign against the opioid crisis, #ChoosePT - First. Members will be brought up to date on critical conversations held with stakeholders on access issues including referral requirements, term protection, differential diagnosis, diagnostic imaging, co-pays, and patient voice and choice. In addition, for every non-member you bring to your October District meeting, you’ll receive one entry into the Membership Matters lottery! For each of your guest(s) who become an IPTA PT, PTA or student member by November 1st, 2017, you’ll earn an additional 5 entries! The grand prize drawing will take place at the November 16th #THIRDTHURSDAY where one name will be picked to receive FREE TWO-DAY REGISTRATION for REVITALIZE 2018 (a value of $450! ).